Bangalore:Renowned Sandalwood actor Sharan inaugurated the two-day national level inter-collegiate cultural fest Mayurika 2018 at St. Claret College on 23.02.2018. He nostalgically recalled how he became a star of his school during a cultural programme when he acted in a drama called ‘Empty Mind’. He explained how that event helped him to discover the star within him. Rev. 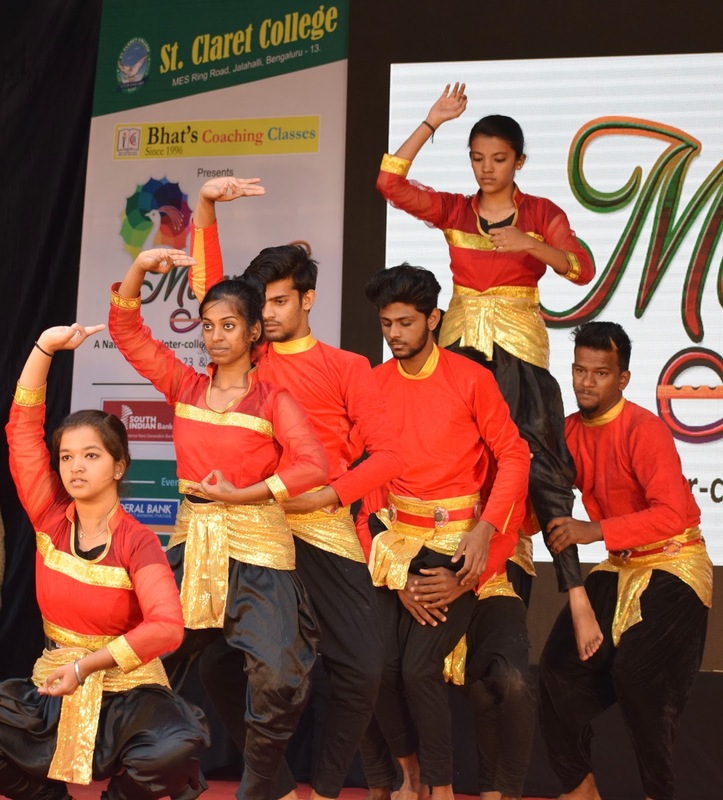 Dr. Sabu George, the Principal of St. Claret College, while addressing the gathering said that Mayurika is 10-year old, and this year’s Mayurika is a leap into the national level, with participants from other states as well. Addressing the media, Rev. Fr. 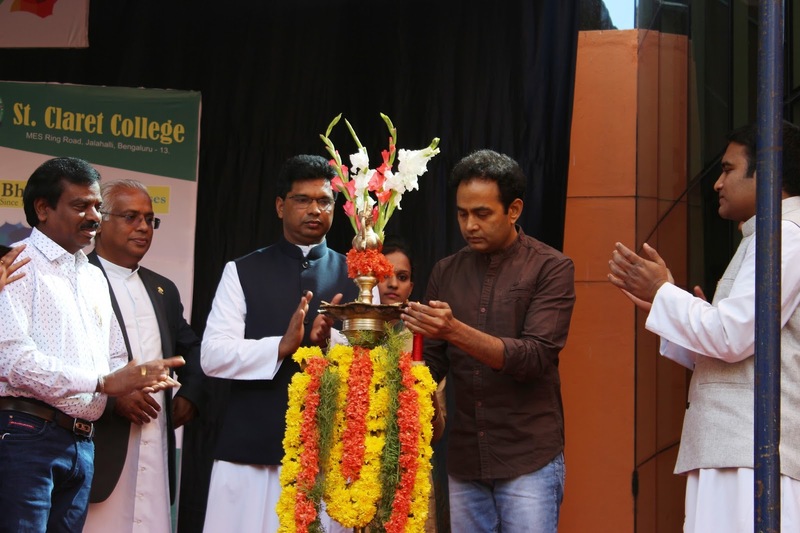 Vineeth George, the Vice Principal highlighted that Mayurika is part of the college’s endeavor to promote the cultural identity of our nation and state. Over the years, Mayurika has been serving as a grand forum for cultural exchange among the students. Students from about 100 colleges will be participating in the 30 different events constituting Mayurika 2018. The special highlights of Mayurika 2018 are a road show by Friendly Superbikers of Bangalore and DJ evening by DJ Bose. Mr Narasimha Jalahalli from the Kannada Film industry; Rev. Fr. Benny Mathew, the Manager; Rev. Fr. Joseph Mathew, the Administrator; Rev. Fr. 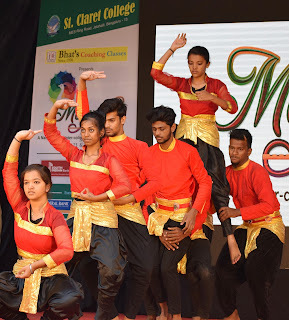 Joshi Xavier, Principal of St Claret School and Mayurika’s Co-ordinators Chaitra, Vasu, and Nice were present at the inauguration of Mayurika 2018. The Title sponsor of Mayurika 2018 is Bhat’s Coaching Classes and the Gold sponsors are Bradford Aviation Academy and South Indian Bank.